I have heard from several people since I wrote about intrastromal ablation. Some believe that incisions in the stroma to affect corneal shape can be done, as described by Dr. Ruiz, and others believe, in the long term, that it will not succeed. I have just heard from Dr. Rupal Shah from the New Vision Laser Centers in India. She is amongst the latter. However, she has been involved over the past ten months in a lenticle removal technique using the VisuMax Femtosecond laser and has agreed to allow me to reproduce the paper she has written about this procedure in my Journal. Note: The technique of forming and removing a lenticle from within the cornea is not a new approach. I wrote about developmental work on shaped lenticles by IntraLase in my 2000 AAO Meeting Roundup, that appeared in the January 15, 2001 issue of Ocular Surgery News. However, as has been pointed out by Dr. Shah, the method of planar applanation and the strong scleral suction used by the Intralase could compress the cornea in an unpredictable way, and therefore reduce the chances of success with such a procedure. The curved interface of the VisuMax Femtosecond Laser, as shown below in her article, along with the light corneal suction and low pulse energy of the VisuMax system seems to be necessary to get good results with such a technique. Trokel and Srinivasan first proposed the use of the excimer laser for corneal photoablation in 1983. Corneal Photoablation involves breaking the intermolecular bonds between tissue molecules, thus enabling precise removal of corneal tissue from the surface of the cornea. In 1988, the first sighted eyes were treated for refractive errors with the excimer laser using a procedure known as photorefractive keratectomy (PRK). PRK was performed by first removing the epithelial cells from the cornea, and then ablating a precise lens from the cornea, using repeated pulses of the excimer laser. PRK allows the safe and predictable correction of refractive errors. However, the procedure has certain limitations, particularly because the corneal epithelium is removed during the procedure. There is extreme pain for the first 24 hours after the procedure, visual acuity is impaired for several weeks after the procedure, there is typically a hyperopic shift during the first few weeks after PRK, and finally there is the risk of corneal haze and regression, particularly in the case of large refractive error correction. To overcome these limitations, a new procedure called Laser In-Situ Keratomeleusis (LASIK) was developed in the early 1990’s. LASIK married the excimer laser with the microkeratome, an instrument designed for lamellar keratectomy. In LASIK, the microkeratome is used to create a hinged flap at about 130 microns depth on the cornea. The flap is then lifted to one side, and subsequently, excimer laser keratectomy is performed on the stromal bed. After the keratectomy is finished, the flap is then replaced, where it sticks back in its original location, initially by surface tension forces, and later by epithelial “glue” around the flap edges. LASIK overcame most of the limitations of PRK, and thus led to a sharp rise in the popularity and appeal of laser vision correction, both for physicians and patients. It quickly became clear that the Achilles heel of the LASIK procedure is the microkeratome itself. It is prone to error, particularly due to the demands placed on what is a really precise but ultimately mechanical instrument. Free Caps, incomplete flaps, irregular flaps, button-hole flaps, displaced flaps, epithelial abrasions and other complications occur in approximately 1% of all LASIK cases. In most of these cases, it is not surgeon error but a result of malfunction, or mechanical error or other infirmities (related to blade quality, for example). In addition, the microkeratome flap is prone to thickness variation. This increases the risk of corneal ectasia, particularly for large corrections and thin corneas. The Femtosecond Laser was introduced to overcome these limitations of mechanical microkeratomes. The Femtosecond Laser is capable of delivering laser energy in an extremely short time (femtosecond pulse width) and very tightly focused in space (in the μm regime). It causes photodisruption within corneal tissue, converting a tiny volume of corneal tissue into a gas bubble, with every laser pulse. When millions of such pulses are laid down in a precise plane at a fixed depth around the center of the cornea, it is possible to create a lamellar slice of the cornea. Thus, the Femtosecond Laser can be used to substitute the mechanical microkeratome in the LASIK procedure. Over the last few years, the Femtosecond laser has developed an excellent safety profile, and is increasingly replacing the mechanical instrument as the instrument of choice for making LASIK flaps. 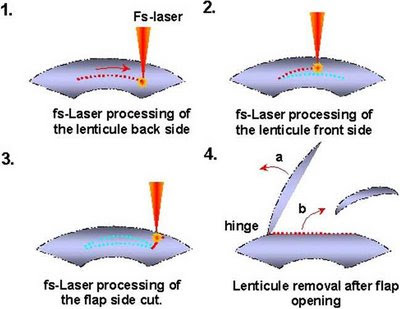 It has several advantages over mechanical microkeratomes in this respect-the flap thickness is more precise, there is little or no chance of flap complications such as button-holes, free caps and irregular flaps, and there is less chance of a displacement, since the Femtosecond laser creates a deep gutter in which the flap “fits” back, thus making it less likely that eyelid movements and such will displace the flap from its place. There is also some evidence that flaps made with the Femtosecond Laser induces lesser higher order aberrations in the eye. While the Femtosecond Laser is very useful for the LASIK procedure, it is not without issues of its own. It means that the surgeon or eye hospital must invest in two rather expensive lasers, i.e. the Femtosecond Laser and the Excimer Laser. The Femtosecond Laser is used to make the flap, while the Excimer Laser is used to ablate the corneal surface to provide the refractive correction. They must pay for the consumables, license fees and maintenance of two lasers. There are also workflow issues related to a two step procedure as well. The patient must at best be moved only from one laser to another while lying on a pivoting patient bed. Due to the two laser configuration extra space is required in the surgery theatre, and the overall procedure time for a complete LASIK procedure is increased. Moreover, now that the Femtosecond Laser has removed the likelihood of flap problems during LASIK, attention is drawn to the limitations of the excimer laser itself. The excimer laser performance is affected by environmental factors such as humidity, there is peripheral energy loss during laser ablation, and the laser ablation is affected by the environment and other factors like corneal hydration, humidity, and the presence of organic vapors. Recently, Carl Zeiss Meditec has introduced a new Femtosecond Laser into the ophthalmic market, the VisuMax® (Fig 1). Unlike other popular Femtosecond Lasers, like the Intralase (e.g. FS60, iFS) or the Zeimer Femto LDV, the VisuMax® has a curved (as opposed to a planar) contact glass (Fig 2). It has special optics to create a very precise spot focused in the cornea with extremely high accuracy (Fig 3). The scanning and focusing optics of the VisuMax® make it capable of placing the laser spot at a specified 3 dimensional position almost anywhere in the cornea. It is already a popular instrument to make LASIK flaps. However, the Visumax is also capable of a procedure, which is called Femtosecond Lenticule Extraction (FLEx®). FLEx® first involves the calculation of the kind of lenticule which needs to be removed for correcting the refractive error of the patient. The VisuMax® is then used to lay down pulses within the corneal stroma to form the lenticle, illustrated in the four steps shown in Fig 4. In the first step, the lenticule backside cut is created. The second step creates the lenticle frontside cut. In another step, the VisuMax® is used to lay down pulses which separate the anterior surface (upper cut) of the lenticule from the stroma. The upper cut of the lenticule is extended a fraction of a millimetre beyond the edge required for the lenticule. It thus serves as the flap. In the third step, the flap side cut is then created to make a hinged flap. The flap is lifted (Fig 5), and the lenticule extracted from the stroma (Fig 6 & 7). The flap is then replaced (Fig 8). The corneal tissue which otherwise would have been ablated off by the excimer laser is removed physically as a whole in the FLEx® procedure (lenticule extraction instead of tissue ablation). Thus, there is no need for an excimer laser for the refractive correction. FLEx® represents the first “All in One” procedure which uses only the Femtosecond laser to complete all steps of the LASIK procedure. FLEx® promises to change the way eye surgeons perform LASIK. It requires investment in only one laser, and paying for only one laser’s consumables and maintenance. It simplifies workflow within the laser suite. There is less total energy incident on the cornea, and there are none of the limitations of excimer lasers, such as the dependence on corneal hydration levels and environmental humidity. It thus represents a possible paradigm shift in the way laser vision correction is carried out. Since 2006, Dr. Walter Sekundo and Dr. Marcus Blum have performed FLEx® in Germany on more than 250 eyes, with a follow-up period of more than 2 years for some cases. They established the initial feasibility and safety of the procedure. The Femtosecond laser, of course, does not need new safety tests related to laser-tissue interaction, since it is routinely used for making flaps on the cornea. New Vision Laser Centers’ Vadodara Center was the third center in the world to start FLEx® and, moreover, also represented the first high volume site to test reliability and performance for high patient throughput clinical environments. We have recently completed a prospective study on 250 eyes, and have at least one month follow-up for all patients. This is an ongoing pre-commercial study supported by from Carl Zeiss Meditec. All patients were informed that the procedure was relatively new, with very little worldwide experience, and with results that were not very certain. A single surgeon (Dr. Rupal Shah) did all the procedures. All the procedures were done within a 5 month period, starting from August 2008. Complete pre-operative and post-operative testing was done. We treated myopia and myopic astigmatism, with a high limit of -10 Diopter Spherical Equivalent. Theoretically, there is no limit on the kind of error that could be treated. Practically, the currently available software limits the treatments to -10 Diopters for safety reasons during the approval phase. The results of the study are quite satisfying. The refractive stability is excellent. There was hardly any change in the refractive status of the patients from the first day onwards. The refractive predictability is also excellent. 96% of all eyes at one month were within a half diopter of the intended correction, which is at least comparable to or superior to all U.S. FDA trials of excimer lasers. There was a very slight tendency towards overcorrection in the low myopes and a very slight under correction for the high myopes. Interestingly, this was all we found in terms of nomogram optimization so far, although we started with a zero nomogram! It demonstrates the capabilities of the FLEx® and shows that FLEx® is more neutral and less sensitive to factors that normally affect excimer laser ablation (e.g. hydration state of the cornea). At three months, more than 85% of all eyes had an uncorrected visual acuity which was the same or better than their preoperative best corrected visual acuity. At three months, more than 90% of eyes had a best corrected visual acuity which was better than or the same as their pre-operative best corrected visual acuity. However, at one month, this figure was only 67%, which indicates that the visual acuity recovers more slowly than with standard LASIK. There were very few adverse events. One eye suffered from DLK, which resolved over time, while we aborted treatment in another patient, because of a suction loss appearing during the procedure. There were hardly any induced wavefront aberrations, and also an excellent topography outcome (Fig 9). Thus, FLEX® compares very well with standard LASIK on stability, predictability, efficacy and safety. However, the visual acuity at the time being recovers more slowly than with standard LASIK. With an improvement in the laser energy parameters, as well as an improvement in surgical technique, visual recovery improved even during the study itself. However, we continue to do more work to find out the origin of the slower visual recovery, and a correction thereof. We are also doing more studies to study the biomechanical stability of the cornea post FLEx®, since there are good reasons to believe that the biomechanical stability after FLEx® would be better than with standard LASIK. In conclusion, FLEx® represents a completely new way of doing laser refractive correction. It takes a familiar technology (Femtosecond Laser) with an excellent safety profile, and uses it exclusively for refractive correction, thus eliminating today’s two laser solution. Although studies in terms of hyperopia correction or the implementation of methods to perform retreatments are currently still ongoing, we clearly see FLEx® becoming part of the refractive surgery main stream. Based on our current results, FLEx® seems to represent a paradigm shift on the way in the field of refractive surgery. Dr. Shah is the Clinical Director of New Vision Laser Centers, and LaseRx, Institute of Laser Medicine. She practices in both Mumbai and Vadodara, India and is a consultant for Carl Zeiss Meditec. Addendum: Since the above article was prepared, Dr. Shah informed me that she has now treated over 350 eyes in this study. Today, with optimization of laser parameters, she gets excellent refractive results, but visual recovery is also nearly similar to standard Femto-LASIK. Ruiz is apparently having success with his intrastromal technique across a variety of treatments, so perhaps Shah was making an economic argument? A detailed critique could make for an interesting post. I don't see significant comparative benefit in FLEX as described, so let's hope they're also working on flapless approaches.